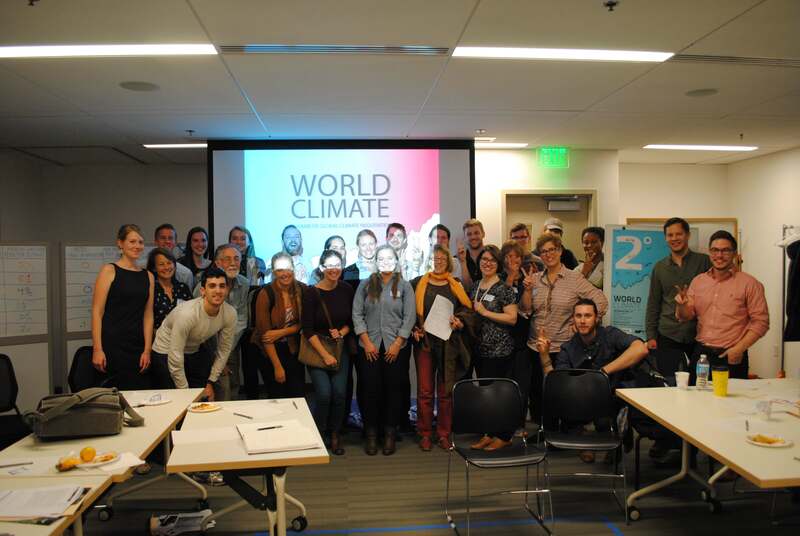 Last weekend, 22 residents of Boston, MA gathered to negotiate a climate deal to limit global temperature increase to 2 degrees Celsius. Presented by Mixed Paper Design Collaborative, the event utilized the Climate Interactive simulation as the centerpoint of a call to action on climate change. The following article is a cross-post from Mixed Paper’s blog, Field Notes by Lukas LaLiberté. For three hours on a Saturday afternoon, as our 22 participants assumed their roles as delegates to the United Nations, we were all transported to the Floor of the General Assembly. Together, we witnessed the painstaking formation of a binding resolution on climate change and emissions over the coming century, and discovered how incredibly difficult this complex task is. Through a broad outreach campaign, we assembled a diverse group of individuals with a global perspective, having lived in or visited 49 countries around the world. The event was held at the Boston Society of Architects, but the crowd was not entirely designers. There were students and teachers, engineers and musicians, young citizens and old, all instilled with a desire to learn more about the reality of climate change and the challenges of policy implementation. The result was a poignant series of negotiations filled with passion, last-minute deals, disappointment at failure, and ultimately, a resolve to push for more action. Through three intense rounds of negotiation, we challenged players to assume roles outside of their comfort zone and understanding. Whether it was as a dispossessed delegate of a Developing Nation or a role as a powerful, tenacious Chinese delegate, our players challenged themselves and each other to look beyond their national interests to forge a global deal. Running through the C-ROADS climate model in real-time, we were able to see precisely what warming scenario our agreed upon emissions proposals would produce. In the first round, we watched as delegations made what they thought were reasonable pledges, only to see the disastrous effects at the end of the century. A 2.75°Celsius rise, while commendable, didn’t cut it. Rising seas, warming climates, and a funding shortage forced the participants to crank up the diplomacy. Debates, promises, and complex deals soon began to sprout. Developing nations advocated their needs, pushing the big players of the US, China, and the EU to make stronger commitments. Despite all this, our second round yielded less fruit than anticipated – a 2.5°Celsius rise. And so we dove back in. Despite aggressive tactics by many of the involved parties, our final efforts from three spirited rounds of negotiation produced a warming scenario of 2.25°C by 2100. While it was a vast improvement over the predicted business-as-usual outcome of 4.9°C, it remained a precarious 0.25 degrees C above the accepted scientific threshold – beyond which many systems on our planet begin to break down. We had tried so hard, and pushed beyond the boundaries of what some players considered realistic, and we had still fallen short. Our negotiations, although failed, provided us with a great learning experience. At our post-negotiation roundtable, participants discussed their interpretation of climate leadership, questioning whether those in power were doing enough. We touched upon political advocacy, and explored ways of reaching out to leaders in municipal governments including Boston’s – which has adopted a particularly progressive approach to climate action. .
Our guest speakers helped expand our conversation, utilizing their expertise in climate data modeling, coastal resilience, sustainable business growth and experience as part of the UN delegation to former COP meetings to provoke exploration and sustain an enlivened discussion. This quote, one of many at this past weekend’s event, illustrates the powerful effect that the climate negotiations, our round-table discussions, and the remarks of our guest-speakers left on all of us. Although we failed to reach an agreement that would limit our world to a two degree Celsius rise in temperature, we left the event with two powerful tools: knowledge and hope. Knowledge that we can advocate for and provoke change in our communities, and hope that the future of our city and our world can be made collectively better. Our experience as facilitators of World Climate augmented our fundamental belief that design, science, and advocacy can be a catalyst for sustainable development that ultimately fosters resilient and thriving communities. The simulation instilled in us a heightened sense of understanding about the complexity of climate change policy, and a renewed reverence for the weighty task of those who will negotiate in Paris in December.